I've been meaning to put this up for a while, although I suspect it will have a limited audience due to its quirks. - CEM 3340 based VCO, essentially the reference design. - Designed for +/- 15V, may run at +/- 12 with some adjustment. - Euro format (10HP), circuit and panel PCBs, no wiring. - Circuit and panel PCBs both single sided for ease of DIY. - Exp and linear (DC coupled) frequency inputs. - Hard and soft sync. - Triangle and saw outputs only, intended for external waveshaping. I started doing DIY synth many years ago, and bought several Digisound boards. Then I had children. Just recently I dug out those old boards, decided to repackage them, and came up with this design. 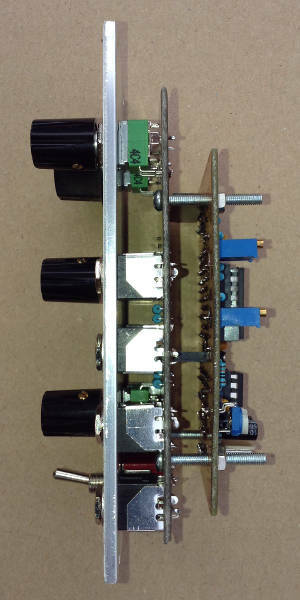 - The triangle and saw outputs are both buffered and adjusted to +/- 5V. Two trimpots adjust the offset. - Layout accepts 2.5 or 5mm decoupling caps, two sizes of trimpots, various sizes for timing capacitor. - Three holes to join the circuit and panel PCBs. - The 10 turn trimpot near the top of the board is V/Oct adjust, the one near the middle is High Freq adjust. - on the circuit PCB, use standard pin headers. Normally, you would insert the short leg through the PCB. Instead, insert the long leg, then push the short end of the pin into the plastic support until it is flush. You can now solder the base of the long leg, and still have a full length pin to insert into the socket. - on the panel PCB, use right angle female pin headers. Normally, these would be laid flat against the board with the pins inserted into holes. Instead, the pins are soldered flat on the copper side of the board, so that the headers stand upright. It is easiest to solder the pin header first, then attach the female, loosely assemble the boards, and tack a couple of pins in place before disassembling and soldering the rest of the female connector. Why no output for the pulse wave? Ran out of room on the PCB! It's designed for home etching, so it's single sided and has nice broad tracks. Also, I was always planning to do waveshaping separately. Triangle and saw give you everything you need for that. Just need to source 3340s at a reasonable price. Yup I know Doug sells them, but economical, sadly, it isn't! CEM3340's are now back in production. This is what a guy posted on "Vintage synth repair and mods" Facebook group. Dear all, I've been speaking with onchip for the last 3 months and they have already produced a new batch of CEM 3340. They are available for $15 each! We have tested them and they are revision G and pass our tests on the original Curtis test boards and also various synths we tried them in. Additionally they have no plans to release the 3310, 3320 and 3360 yet but I think if they see the success of the 3340 it may be apparent the market needs them. I am in communication with them and will continue to push for the other chips to be brought back but to be honest the release of the 3340 is great news as that was the most common curtis chip used. Postage is in addition to this. I hope you enjoy and spread the word!! Very nice! I've always had this dream of building a massive DIY polysynth, although I have next to no electrical engineering experience. Using CEM chips seems like a plausible way to do it now that they are back in production! I'm very happy! Very nice module too. I definitely would lay out the pots and jacks a bit differently, and get the pulse wave going though. Super stoked, looks good. Very happy with this man! Great documentation for the 100% DIYer like me! I tried to download your Zipped Build File and it said the files have been moved. 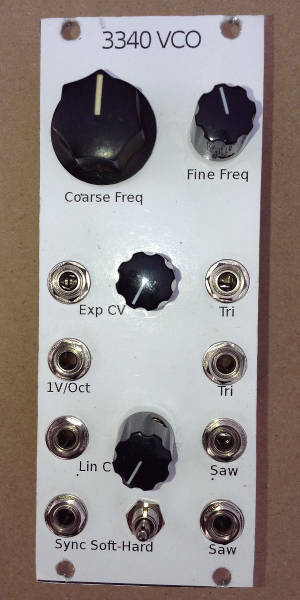 I am interested in building this VCO. Any chance you could send me the info.